David and Marquita Mosher are global missionaries for the Church of the Nazarene serving in Malawi. David is Principal of Nazarene Theological College of Central Africa (NTCCA) in Lilongwe, and involved in the TEACH Africa programme. From 2008 to 2010 the Moshers served in Zambia, Africa, and previous to that assignment they served in Sao Tome and Principe. Their assignment in Zambia included assisting in pastoral leadership training on two districts. 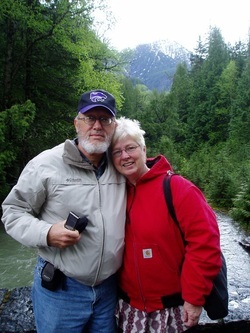 David served as field treasurer and Marquita assisted in training children's ministry leaders. The Moshers began their missionary service in the Kingdom of Swaziland in 1983. They spent 10 years working at Siteki Nazarene High School. They also assisted at the Nazarene Bible College and were involved in outstation church work on the weekends. In 1994, the Moshers were assigned to the northern provinces of Nampula, Niassa and Cabo Delgado in Mozambique. Their ministry involved training lay leaders as well as directing church planting and training of church leaders. The main work there was among the Macua tribe, which was the largest unreached people group in Africa at that time. The Moshers served in Mozambique until assigned to Sao Tome and Principe in 2001. David received a B.S. from Southern Nazarene University, in Bethany, Oklahoma. He received an M.A. in missiology from Nazarene Theological Seminary in 1993. Marquita received a B.A. in religion from Southern Nazarene University. David and Marquita were both ordained in Maputo, Mozambique, in 1996. The Moshers have two adult children, LeCrecia and David C.